Happy new year! Other than coverage of the Mitsuwa Marketplace Umaimono Food Fair, it’s been radio silent since the first Recent Rundown in November. Here’s a quick catchup to get us off on the right foot for 2012. We put on a webinar for our member companies featuring Gavin Neath, Unilever’s Senior Vice President of Sustainability. Gavin spoke about the company’s efforts to address sustainability challenges across its global footprint, including its commitment on procurement of sustainable palm oil. I also started preparations for the first handful of webinars for 2012, which include presentations on the Sustainable Apparel Coalition and ISO 50001 certification. We hosted a virtual roundtable for a small group of our members to discuss the state of corporate sustainability reporting. We launched the application period for our 2012 CEF Member Challenge: Journey to Camp 41 in Brazil’s Amazon Rainforest. CEF will sponsor 5 winning employees from CEF member companies to attend an all-expenses paid sustainability leadership development program in Brazil’s Amazon Rainforest led by ecologist Thomas E. Lovejoy. Our nonprofit is nearing completion of all its legal filings and approvals, thanks to the tireless efforts of founder and friend Christa. While we wait, we continue to explore opportunities for the organization to deliver yoga classes in therapeutic settings. We launched the Compass Yoga YouTube channel and produced some simple but helpful instructional videos as a holiday gift to the veteran community. I had fun getting familiar with the video capabilities of my Lumix LX5, but think we’ll want to get editing software that can render in high definition formats once we start looking to produce more sophisticated material. I also stepped into the role of treasurer for the board. After a bit of trouble getting things together, all of our volunteer consulting engagements are now off and running. I’m coming up on inflection points with both Mandarin Chinese and Japanese study. I’m about to finish stages for both that will require some decisions about what goals I must set next and how each will be approached. I’ll go into detail in an upcoming post, once I’ve hit the milestones. Min, Mei and I made it out to a new ramen shop in Midtown on what was a very, very cold day (no better setup for enjoying a big bowl of noodle soup). Tabata Noodle tries to cover many bases, with an extensive selection of ramen varieties. Ramen shops are generally “I-shaped”. They specialize in one type of soup only (or a family of related broths) and develop deep expertise. We got the feeling Tabata spreads itself thin by trying to offer every type of ramen imaginable, based on tastings of shio (salt) and shoyu (soy sauce) bowls that, while not half bad, don’t have the depth and character that make a great slurping experience. I’ll definitely be back to try some of their other offerings, but Minca/Kambi, Ippudo and Hide-chan remain uncontested as my default destinations for transcendental noodling. Last, but certainly not least, I’m happy to report that as the baby is finally sleeping through the night (or almost all night) on a relatively consistent basis, it’s my intention for 2012 to get back in the habit of writing more regularly on this blog. After becoming a new dad and starting a new job, I had to back burner interests and projects that didn’t fit into the time available. As we all learned how to work with our new schedule, I’ve gradually reinserted outside obligations, language study and reading. Writing was one of the things I had missed the most, but also proved to be the most challenging to bring back into the fold. It was not just a question of time, but of needing to relearn how to focus and quiet my mind long enough to put together thoughts that spanned more than 140 characters. The photo posts I published over the last handful of months helped me tread water, but I’m looking forward to chewing on things more thoroughly. I’ll experiment with using this rundown format as a way to report progress with ongoing projects or news that doesn’t quite merit a whole post. You have indeed been busy and every day am grateful for your support and efforts on Compass! 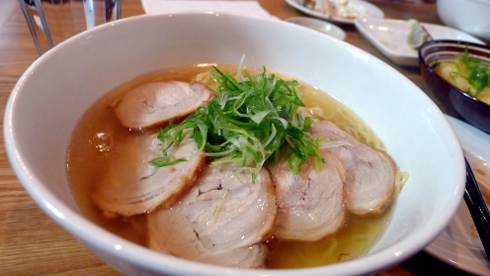 ‘Tis high season for ramen – Minca is calling us! So glad you will be back to writing in 2012. The world needs your voice.